When I heard Polly’s eating disorder recover story I knew I had to share it. Working in the field of eating disorders can be frankly hard work. It is a long road to recovery and a battle. It takes dedication, support from others and challenging yourself at every meal time. However it is possibly and it is worth it. I hope sharing this inspires others. “It took 10 years for me to finally ‘come out’ and be open about my Eating Disorder. But now I’ve come to realise that in being open I can help others, never will I keep quiet again. I hope that by sharing my story I can help you, or someone you know who is struggling, and show you that recovery is possible. Why was I silent for so long? I didn’t think anyone would think negatively of me. At age 33 all my peers are open and mature enough not to judge in such belittling ways. Perhaps it was that people wouldn’t take me seriously as a health professional – I’m a Personal Trainer & Nutritionist who helps Mums get in shape. Ironic? Not really. Because needing to lose weight or gain weight often come from the same root psychological cause. I think a lot of it was that I just wanted to forget that horrible time in my life, sweep it under the carpet. But in doing that I’m not able to help and inspire others. The can of worms had to be opened. They say that to develop an eating disorder you need to have the right genetics (science shows there’s a link), the right personality (typically perfectionistic and with high personal standards – me to a T), and an immediate trigger or stress at the time of developing the disorder. I first felt fat age 8. My Dad got remarried and family life was changing. Not in a bad way, but a lot for a young child to process. I first made myself sick age 12 at boarding school. I was bullied, not for being ‘not skinny’ (I wasn’t fat), yet somehow I figured being thin was the answer. But the problem never really took off until, at age 17 at dance school (i.e. where we spent all day in a leotard being judged on how good we’d look on TV), and my then boyfriend was sent to prison. I was also living alone in London and had struggled to fit in at the college. On a subconscious level, all would be well if I lost 3 kilos. Then I would be happy. Reading this back, how silly does that sound now? I only ever meant to take the laxatives (half a box of them) once, just to ‘erase’ Christmas day. Each day I would swear on ‘no more Yule log’ and it was salad from now on. I never binged, but every time I ate something ‘non-diet’, I took more pills. Or vomited. Or did an extra 4 hours exercise (it was the holidays, I had time). Or all of the above. Nobody knew. I was way too ashamed to tell anyone. It was only when this cycle started to impact my daily life about 6 weeks later – skipping classes to make myself sick, blocking up the loo in my flat, not being able to think about anything else but my fat thighs and pathetic self-will, that I switched to a new tactic – restriction. It started innocently enough – cutting out fat, then bread, meat……until I was probably living off about 500 calories a day of primarily vegetables, and my condition was noticed, I was removed from dance school, and put under the care of an outpatient clinic. And herein began six years of treatment that I resisted as much as I could. Meal plans, counselling, CBT, supervised meals, meals in tubs to take home to eat, and three times I was hospitalised at a dangerously low weight. Nothing worked. Why was I so resistant? To say I was miserable doesn’t cut close. If there is a Hell, I have been there. I was also diagnosed with extreme clinical depression unresponsive to medication, borderline OCD, showing bipolar ‘tendencies’ and one therapist suspected I had Borderline Personality Disorder, which some say is what Amy Winehouse had before she died. I self-harmed, and I attempted suicide twice. But my eating disorder kept me safe. By this time it was a way of life, it was my identity, and in some distorted way it made me feel special. This is what it comes down to in the end – I never felt special. I felt like a worthless waste of space, yet ironically struggling with this eating disorder only reinforced how much of a waste I was. After all I was putting my family through so much stress and worry. None of it makes sense, but I guess that’s why mental illnesses are so hard to recover from. So how is it that I can be here today, happier than I have even been in my life, married with two children, and helping other women learn how to treat their body well? I often get asked what made me finally recover. Honestly? I don’t know. I remember being in a pub garden one summer with a couple of friends, fresh out of another hospital admission and going downhill already. One companion announced she was getting married, the other that she was pregnant. Suddenly for the first time since I developed anorexia, I felt lonely. The eating disorder had been my only friend who stuck by me, yet this ‘friend’ was turning against me. Everyone was growing up, creating careers, moving on with their life. I was stuck in this child like state, being left behind. If there’s one dream I had all my life even throughout the illness, it was to have children. A little girl I could bring up as my little princess. That was not going to happen if I carried on. I was at that time infertile and no man in their right mind would be attracted to an emaciated mess. It was like I woke up, or a lightbulb went off, or something switched in my brain. I didn’t want this illness in my life anymore. This time I really didn’t want it. That’s not to say it came easy. Anorexia is like having a little devil on your shoulder, dictating what you should and should not eat, telling you how pathetic you are if you give in and eat. I’m not going to lie – those voices are still there every day, even 10 years on. But there’s a difference. Now, I shout back louder. It’s a fight, every day. I know people who seem to have completely recovered and they think the same way about food and their body as any ‘normal’ person. I may get to that place, I may not. But I’m happy, I’m healthy, and I will keep on winning this fight. 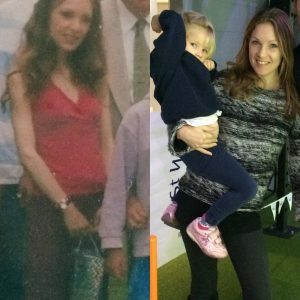 Pollyanna Hale helps Mums lose weight and get their body confidence back via online coaching with www.thefitmumformula.com/. A qualified Personal Trainer, Polly knows from personal experience and though helping hundreds of women that there is more to having a healthy body than just following some cookie cutter meal plan. Long term success comes from learning to love yourself and your body and treating it with the respect it deserves. It doesn’t matter if you’re overweight or underweight, or somewhere in between. The weight is just a symptom. Everyone deserves to feel special. Previous PostSnack Attack: Wellaby’s reviewNext PostRestriction and Eating Disorders.